As the world’s most famous pollinator at this point, given all of their coverage following the arrival of colony collapse disorder, honeybees are known for their effectiveness and their crucial role in agriculture production. Interestingly, however, they are surprisingly ineffective when it comes to pollinating certain crops, such as tomatoes and blueberries, that other pollinators can. For blueberry plants specifically, honeybees can’t release pollen out of the bell-shaped flower’s porose anthers through something called “buzz” pollination as bumblebees can. This form of pollination is exactly what it sounds like in that pollinators must vibrate their bodies in order to release pollen, which honeybees cannot do while planted. This leads to a largely unsuccessful attempt to reach both the pollen and the nectar within blueberry blooms—most of the time. 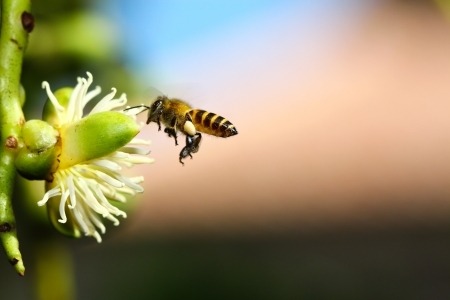 According to Oregon State University’s George Hoffman, who is an ecologist, pollination specialists rarely find pollen from blueberry blooms inside honeybee hives. However, his recent study revealed that most large commercial blueberry farmers in Oregon utilize honeybees for large-scale pollination, with stocking rates of five to eight hives per hectare (about 2.5 acres) resulting in high blueberry yields. Legitimate pollination visits by honeybees are often thought of as when the bees insert their heads into the petal opening, which is narrow for blueberry flowers and why bees have such difficulty without buzz pollination. However, while fumbling around trying to get at the nectar in the plant, the bees can get pollen on other parts of their bodies, such as their carrying legs, claws, and tarsi, sometimes even getting one of these parts into the anther itself. Contact between this pollen and the stigmas (female part) of flowers in blueberry clusters occurred about 67 percent of the times analyzed where honeybees landed on a blueberry cluster, according to Hoffman. This could be why these commercial blueberry farmers out in Oregon saw unexpectedly high rates of honeybee pollination of their crops. Hoffman concluded that honeybees are definitely pollinating blueberry plants, at least much more than anyone could have anticipated previously, but he has noticed something else interesting about honeybees and their relationship with blueberries. During his analyses, Hoffman has witnessed honeybees rub blueberry pollen from their legs before kicking the pile of it away from them. Hoffman suspects that blueberry pollen does not end up inside of hives and the bees’ honey stores because, for some strange reason, the bees simply do not like it.